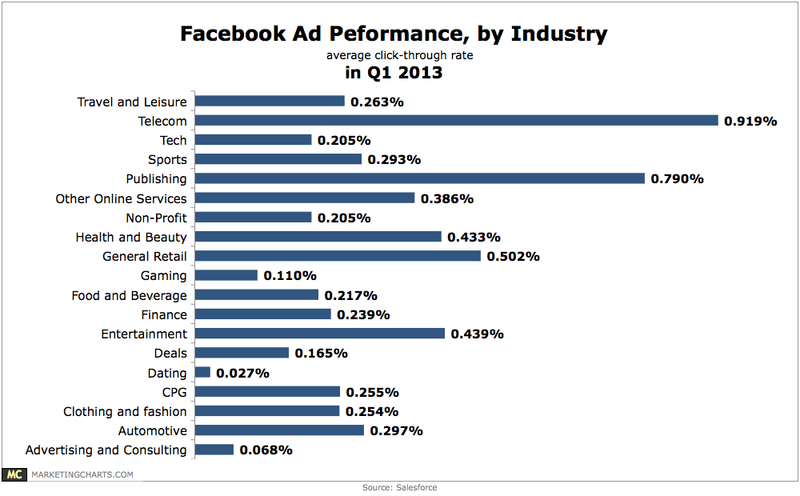 Most marketers and advertisers have a love/hate relationship with Facebook Ads. You either have high Cost Per Click, and are on the hate spectrum, or you have low CPC and are on the love spectrum. It all comes down to do you know what you’re doing, and Quaintise absolutely knows what we’re doing. Don’t worry, we’ve got the stats to back up these claims. Before we jump into how amazing Quaintise is with Facebook Advertising campaigns, we’ll need to dive into that actual numbers that advertisers are seeing on Facebook. It’s important to have your feet grounded in the reality of Facebook Advertising before we shoot you to the moon with some amazing numbers that we easily obtain for our clients. Meanwhile, costs per click (CPCs) across the 5 markets rose by 9% in Q2, though only the US (13%) and Canada (12%) saw increases, both passing the dollar mark to $1.04 and $1.02, respectively. The UK saw a 2% decrease in CPCs (to $0.91), while Germany (-9%, to $0.56) and France (-10%, to $0.41) also saw CPCs decline. According to TBG Digital, health (0.064%) was the top sector by CTR in Q2, followed by pets and animals (0.06%) and not for profit (0.056%). Entertainment dropped 3 places to the 4th spot (0.054%), while retail was in 8th (0.039%). For each client and each campaign, the advertising strategies vary based on the purpose and goals of the campaign. For example, do we want to drive traffic to the website or a specific page? 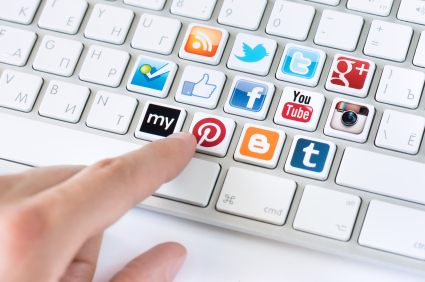 Do we want to simply increase overall Reach and increase brand visibility? Are we looking to augment the client’s Fan Base on their Facebook Page? Or are we spreading some news, offers, or special? Each goal has a set of marketing and advertising strategies to accompany it. In this specific case study, we’ll take a look at how one weekend campaign turned into a record-breaking ad which, for a mere $155, Reached nearly 50,000 people, Engaged over 2,300, maintained a CTR of 4.762% and a CPC of just $0.07. 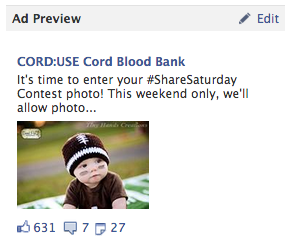 Target Audience: CORD:USE Cord Blood Bank primarily wanted to target pregnant women for this specific campaign, so with Facebook Interests we hyper-targeted based on demographics and populations that would be most interested in the use of cord blood banking. We also specifically targeted the locations which were already highly engaged with the CORD:USE brand. Creative: The Ad itself was created with the sole intention of getting pregnant women to notice the CORD:USE brand, and that was completed by using Super Bowl weekend and babies. I mean, you can’t really go wrong with football and babies. We ran the ad for only three days, over Super Bowl Weekend. As you have already seen from the numbers, it was a huge success. You too can have these same numbers! Call Quaintise today for more information!